Home / Uncategorized / National Bed Month is here! March is here and that means something quite important in the land of nod – it’s National Bed Month. National Bed Month is a monthlong awareness campaign from the Sleep Council that takes place every March. Dedicated to improving a good night’s kip with a supportive and comfortable bed, the Sleep Council have kicked the month off with five sleep hacks to get you ready for bed. Encouraging you to take a Bed MOT, to think about the friendliness of your sleeping environment, to change the way you wind down for bedtime, to think about lifestyle and to keep a sleep diary, Lisa Artis is the Sleep Council’s sleep expert and her top sleep tips are a great way to kick off a month centred around your sleep needs. Visit the Sleep Council to read more https://sleepcouncil.org.uk/celebrate-national-bed-month-with-these-five-hacks/ and to find out more about National Bed Month. And if you are in the market for a new bed this National Bed Month, why wouldn’t you a bed from the Bed Manufacturer of the Year 2018/19? Ahem… that’ll be us then! 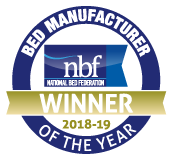 Yes, Millbrook Beds was voted the National Bed Federation’s Bed Manufacturer of the Year in September last year – it’s an accolade we’re incredibly proud of and it’s a perfect way to celebrate the #perfectsleep we’ve worked so hard to bring our customers.